POSTED June 8, 2018 9:48 a.m.
LA CROSSE – After winning two state titles and two other state medals during a whirlwind performance at Saturday’s WIAA State Track and Field Meet, senior Emma Lawrence had one thing to do before settling down to watch the girls’ 4x400-meter relay race, which would determine whether her team with win a gold or silver state trophy. “I’m excited to go eat,” admitted Lawrence. Despite having just three state competitors competing in six events compared to Algoma’s 11 state competitors in 12 events, the Benton/Scales Mound/Shullsburg tri-op held a one-point lead over the Wolves in the girls’ team standings with just one event remaining– the 1,600 relay. The Zephyrs didn’t have a team running in the event, but Algoma did coming in seeded eighth overall. If their seed held, the Wolves would tie the Zephyrs for the team title. If they improved their seed, they’d finish first and push the Zephyrs to second-place. However, if they finished ninth or 10th, the Zephyrs would be crowned champion for the first time in program history. With the BSMS athletes, coaches and fans cheering wildly from the stands, eight of Algoma’s nine competitors finished ahead of the Wolves in the 4x4 to leave the Zephyrs (40 points) clinging to sole possession of first-place in the final Division 3 girls’ standings ahead of Algoma (39 points). Ozaukee and Newman Catholic tied for third with 38 points to make for a very interesting finish. “Honestly, this never crossed our minds, so when Coach (Todd Bastian) told me when I was done that we were for sure going to bring home a trophy, I was in shock,” added Lawrence. The team title was the cherry on top of an already sweet weekend in La Crosse that saw the BSMS girls’ and boys’ teams win eight state medals in the 11 events they were competing in at UW-La Crosse’s Veterans Memorial Stadium on Friday and Saturday, June 1-2. Lawrence came into Saturday’s finals seeded first in both the 100-meter high hurdles (15.00) and 300-meter low hurdles (44.60) after setting program records in both events following a spectacular preliminary performance at Friday’s meet. She was also seeded in second-place in the 200-meter dash and fifth in the triple jump coming into the final day of the season. The Benton standout lived up to all those seeds on championship Saturday, sweeping the state titles in the hurdles events by winning the 100 hurdles in 15.23 seconds and the 300 hurdles in 45.11 seconds, while placing second in the 200 (26.07) and finishing fifth in the triple jump (35’9”) to account for 32 of the team’s 40 points. Saturday’s performance was even more special for Lawrence since she did it all on the track she will be calling home the next few years. She will attend UW-La Crosse in the fall and compete on both the women’s volleyball and track and field teams. “I think it calmed me done because this is my home. It was kind of cool to do it here,” Lawrence remarked. Leahy added a silver medal to her state collection on Friday afternoon, finishing a career-best second in the D3 girls’ shot put with a toss of 42’4.25” on the final throw of her prep career. While that throw came up just one inch short of state champion Emma Richards’ mark of 42’5.25”, it also moved the Shullsburg senior from third into second-place ahead of Algoma senior Katelyn Williams. That four-point swing in team points proved critical towards the Lady Zephyrs winning team title the next day. “It was a little disappointing falling an inch short, but at the same time being second in state to end my career is pretty cool. 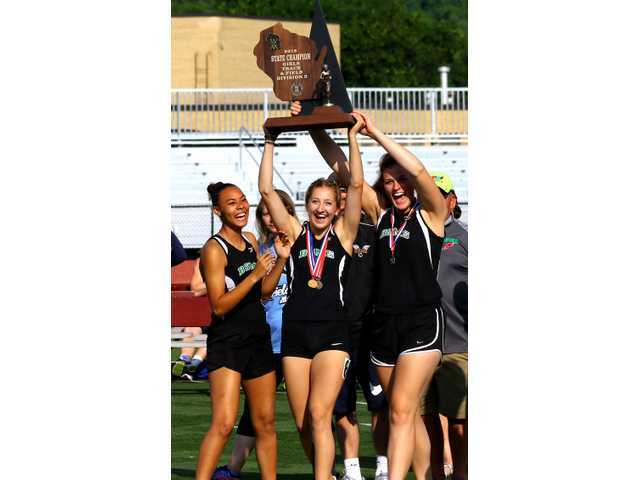 It’s been an unforgettable career,” said Leahy, who also finished second to Richards, a senior from Ozaukee, at the State Indoor Track and Field Meet in April. Scales Mound junior Trinity Law, the third member of the BSMS girls’ state championship team, ended her season by placing ninth in the girls’ high jump (4’10”) on Friday afternoon. In the boys’ D3 state meet, the BSMS crew captured three state medals on Saturday. Benton senior Aaron Pulvermacher used a tremendous late kick to place second in the 400-meter dash in a tri-op record time of 50.27 seconds, and he teamed with fellow seniors Ethan Shetler and David Germaine and junior Troy Turpin to place third in the 4x400 relay in another tri-op record time of 3:27.82. “Aaron had a tough race yesterday where he was really tight running. He came back today with a great race. Boy, he came off that final corner and gave himself a shot to win it,” commented Bastian. Sophomore Matthew Davis took fifth in the high jump (6’2”) and senior Ben Davis, his first-cousin, added a 14th-place finish (5’10”) in that same event. Turpin and senior Josh Redfearn combined with freshmen Chandler Kelly and Niko Karavergos to take ninth in the 4x800 relay (8:28.85) on Saturday morning. Coach Bastian gave much of the credit for the team’s success to Paul Raley, who stepped down as the tri-op’s head coach last summer to become an assistant coach so he could work closer with the athletes instead of focusing the duties of a head coach. “I inherited this team from him. It was mostly his doing,” Bastian wanted known. Raley’s influence really showed up in the hurdle events where Lawrence won two state titles for the Zephyrs and Darlington senior Grady Rielly claimed the D3 boys’ 110-meter high hurdle title and added a second-place finish in the 300 hurdles. Since neither Benton, Scales Mound or Shullsburg has their own track, Darlington has allowed Raley and the Zephyrs athletes to come over to their track to train during the season, which led to coaches and athletes from both teams working closely together to make each other stronger in their respective events. Lawrence and Rielly had a bit of a friendly rivalry going on throughout the season comparing their times in their hurdles events, so it was only fitting that the pair won their state titles just moments apart in the 100 and 110 hurdles in identical times of 15.23 seconds. They were each a little freaked out when they found that out. Both athletes also gave praise to both teams’ coaching staffs following their stellar state performances on Saturday. “All the coaches have been really supportive. We’re like one team even though we’re really two teams from different towns,” Lawrence said.